A crochet beanbag chair is an easy project even for the beginner. With six skeins of yarn, you can create your own crochet bean bag chair by using the single crochet stitch. This project requires knowledge of the chain stitch, slip stitch and single crochet stitch. You will also need to be familiar with how to increase and decrease stitches. Begin by placing a loop on your crochet hook and then chain four. A chain stitch is done by putting the yarn over the hook and then using the hook to draw the yarn through the loop on the hook. Slip stitch into first chain. A slip stitch is placing the hook through the stitch, and then putting the yarn over the hook. Now draw the yarn through the stitch and the loop on the hook. Then chain one to start the first round of crochet. Single crochet a total of 15 into the circle created by the slip stitch. 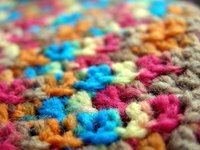 A single crochet is done by placing the hook through a stitch and then yarn over the hook. Draw the yarn through the stitch and yarn over once again. Draw through the loop on the hook. Join with a slip stitch into the chain one. Place a stitch marker into the chain stitch, and move the stitch with each round. You should have a total of 16 stitches counting the beginning chain one. Chain one and place two single crochet into each single crochet from the previous round. Slip stitch with chain one stitch. The next round you will place two single crochet into one stitch and then one single crochet into the next one. You will repeat this until you have reached the chain one stitch. Each round you are adding 16 stitches. With each additional round, you will add one to the number between the increased single crochet stitches. For example, the next round you will single crochet two in the first stitch and then place one single crochet into the next two stitches. Continue with rounds and increases until you reach the desired size of your bean bag chair. Now each round will be even with no increases. You will place one single crochet into each single crochet. Continue to work in the round until your work measures 16 inches in height. Begin to decrease the number of stitches each round. You will need to decrease by 16 stitches each round. Count your stitches and divide by 16 to figure out how many single crochets to put between the decrease single crochet stitches. To decrease, you will insert the hook into the stitch, yarn over, and pull through the stitch, but don't pull through the loop on the hook. Instead, insert your hook into the next stitch, yarn over, and pull through all of the loops on the hook. Stuff the beanbag after a few decreasing rounds. Once you have the beanbag stuffed, continue to decrease each round until you are left with a small opening. Take your yarn needle and sew the hole together. Consider placing pellets or beans in the very bottom of the chair, then stuff with fiberfill or foam. This will help to weigh down the beanbag and keep it comfortable. Using a single crochet for large projects can take a longer time. Keep with the single crochet even if it might be tempting to use a half double or double crochet stitch. The tight single crochet is needed to keep the stuffing inside the chair.